President Recep Tayyip Erdogan is expected to announce further measures. He chaired a five-hour emergency meeting of the National Security Council and was expected to lay out a series of emergency measures later on Wednesday, sources told the Reuters news agency. So far about 1,577 university deans (faculty heads) have been asked to resign in addition to 21,000 teachers and 15,000 education ministry officials. Some 626 institutions have also been shut down, most of them private educational establishments, officials say. 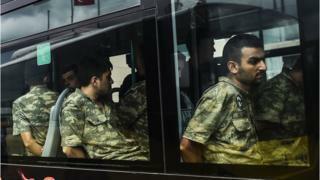 They are suspected of having links to the alleged mastermind of the coup, US-based cleric Fethullah Gulen, who denies any involvement. Speaking to Al Jazeera in Ankara, Mr Erdogan said a lot of people had been arrested, but that the operations had not finished. He added that those detained would provide officials with "many names" in the coming days. The WikiLeaks website has been blocked in Turkey after it released thousands of emails purportedly showing exchanges between ruling AKP officials. The documents - ranging from this month back to 2010 - were obtained a week before the attempted coup and the source has no connection to that event, WikiLeaks says. Turkish daily Cumhuriyet said that one of the emails contained a letter sent to President Erdogan. "My family and I suffered in our own country because of your actions. Aren't we as precious as Egyptian Esma?" it says, in a reference to Mr Erdogan's tears on TV after the daughter of a Muslim Brotherhood politician was killed in Egypt. Other emails contain media reports on Fethullah Gulen and his movement. Mr Erdogan also said he learned about the coup from his brother-in-law, reacting with "disbelief", and that he believed foreign countries might have been involved, without naming any. As soon as it became clear that the coup had failed, the purges began, first with the security forces, then spreading to Turkey's entire civilian infrastructure. Human rights group Amnesty International warned of a "crackdown of exceptional proportions", including measures to censor media outlets and journalists, some of them critical of government policy. Extending the clear-out to include the education sector, university rectors have been asked by the Higher Education Council to "urgently examine the situation of all academic and administrative personnel" linked to what it calls the Fethullah Terrorist Organisation (Feto) and report back by 5 August. It has also told universities that academics who are already abroad on work or study missions should return home "within the shortest possible time". A government official told Reuters that the ban on academics travelling abroad was a temporary measure implemented to stop alleged coup plotters in universities from fleeing. Turkey is also pressing the US to extradite Mr Gulen, and White House spokesman Josh Earnest said a decision would be made under a treaty between the two countries. Meanwhile, Turkey's military announced that it had resumed cross-border strikes against Kurdish rebel targets in northern Iraq, killing about 20 alleged militants. They were the first since the attempted coup. F-16 jets were reported to have targeted positions of the banned Kurdistan Workers Party (PKK) in Iraq's Hakurk region, Anadolu Agency reported. The Turkish military has regularly targeted suspected PKK bases in Iraq since last year. Also, local media said Turkish F-16 jets had launched an operation to check rumours about two coastguard vessels that were said to be missing, which was later denied by a Turkish official to the AFP news agency.